NETWORK UPDATE: THE BIG BANG THEORY gained 0.2 in adjusted numbers, although at 3.7, that still left it far behind last year’s 4.9 season finale. Elsewhere, GREY’S ANATOMY lost 0.1. CABLE HIGHLIGHTS: With no NBA game scheduled, Spike’s LIP SYNC BATTLE took a share of the Thursday cable lead, up 0.07 from last week to 0.66. WWE (Syfy) was also at 0.66, which was up 0.02 from last week, with lead-out OLYMPUS down 0.03 to 0.13. NBC Sports Network’s NHL PLAYOFFS game was right behind at 0.65, although the night’s early game was considerably lower at 0.25. 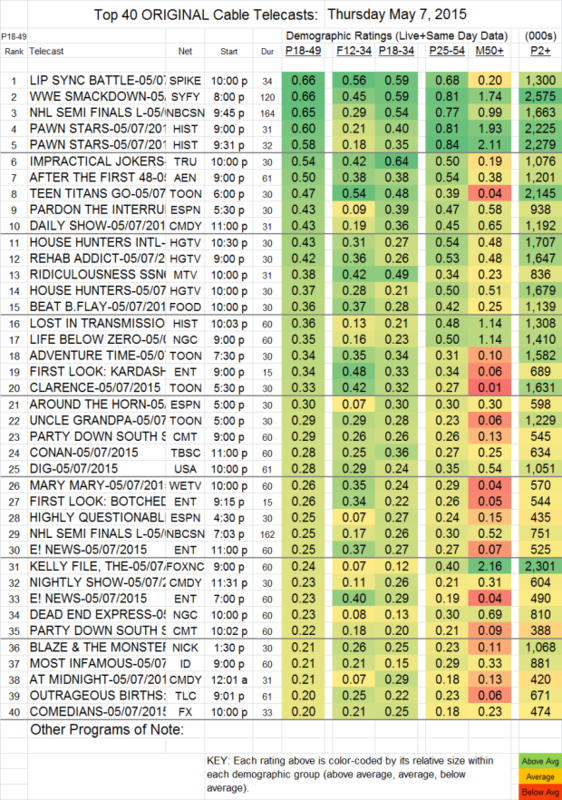 On History, PAWN STARS was at 0.60/0.58, and LOST IN TRANSMISSION was at 0.36. Tru’s IMPRACTICAL JOKERS took a nice leap up, by 0.16 to 0.54. AFTER THE FIRST 48 (A&E) was at 0.50. RIDICULOUSNESS (MTV) gained a tick to 0.38. The finale of DIG (USA)–which the network termed a “season” finale, although it had been marketed as a closed-end “event”–jumped up 0.09 to 0.28. MARY MARY (We) lost 0.06 to 0.28. On FX, THE COMEDIANS dropped 0.09 to 0.20, and LOUIE fell 0.06 to 0.17. Given today’s news about Bill Simmons’ unceremonial ousting at ESPN (technically a non-renewal of his contract, although publicly announced a very unusual 5 months in advance), it’s interesting to note that his GRANTLAND BASKETBALL HOUR scored 0.19, below the network’s afternoon talk show franchises. Bravo’s REAL HOUSEWIVES OF MELBOURNE was at 0.12. Not even hitting the supplemental list: RED ROAD (Sundance), up 0.01 to 0.04 (and slightly up with total viewers to 183K).